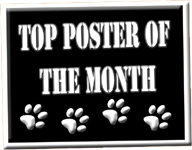 Congratulations to @2bullymama for being our Top Poster of the Month! Just barely beating @alice kable by just 1 post! Congratulations and way to go, Christine!! !